Posted on April 20, 2014 by Worth Stopping By . . . 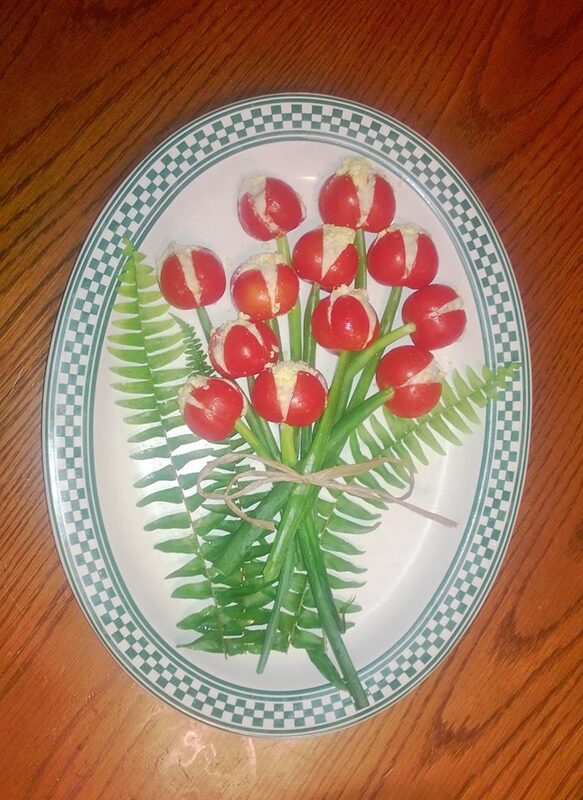 I made these Tomato Tulips for the birthday celebration of one of my closest friends, Stacey. I just think that this unusual appetizer is beautiful enough to double as a centerpiece. This is another idea that I snagged from Pat Duran at justapinch.com. The recipe is something of a finely blended potato-egg salad mixture. Unfortunately, I couldn’t find any long grape tomatoes, the plums were too big, so I settled on some big, fat campari tomatoes instead. Be creative. I would love to try these again with a tuna salad filling or perhaps a white cheddar pimento cheese (?). 1. Separate cooked yolks from egg whites; refrigerate yolks for later in recipe. In a large bowl, combine the first nine (9) ingredients and the chopped egg whites only. 2. Mix thoroughly to blend. Add additional mayonnaise and half and half , only if needed. Mixture should be moldable. — Spray mixing bowl lightly with cooking spray , sized just large enough to hold filling completely to the top. Place potato mixture into bowl, making sure to pack firmly. Cover and refrigerate until ready to fill the tomatoes. 3. Making tulips: Use elongated (oval shape) large grape tomatoes. Cut a tomato crosswise, but not to the very bottom. Remove the flesh out of each tomato and put some salad inside. Sprinkle a little grated egg yolk in center tops. Make the tulip stems out of green onion tops. Add some dill as greenery. Put a bow around your bouquet. Posted on April 15, 2014 by Worth Stopping By . . .
It’s probably time that I admitted that I am a terribly picky eater. I probably eat only about 5% of the dishes that I prepare. That being said, it should be no surprise that I don’t like mushrooms . . . but I love, love, love to cook with them! This recipe (from allrecipes.com) is really lovely. The mushrooms are grilled first, and then sautéed with shallots and white wine until reduced. I think that roasting the mushrooms in the oven would be as effective if grilling is not convenient. These mushrooms would be wonderful as either a small plate or a side. The best part was the aroma that filled my house while it was cooking. 1. Rub mushrooms with olive oil and place on a grill over high heat, smooth side up. Grill until they start to soften, about 10 minutes. Turn over, and grill on the other side for about 5 minutes. Remove mushrooms from grill and slice. 2. Meanwhile, heat olive oil and butter in a large skillet over medium heat. Add the shallot, and saute for a few minutes, stirring frequently. 3. 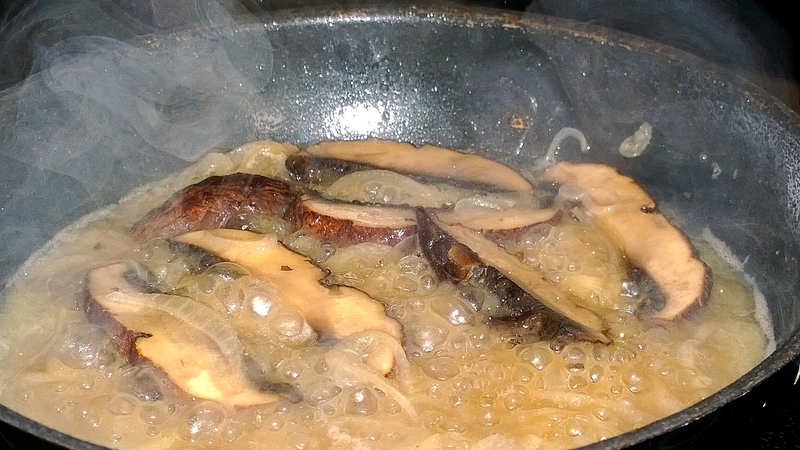 Add mushrooms to the skillet, and increase the heat to high. Cook for about a minute, then pour in the wine. Continue to cook and stirring to deglaze until the wine is nearly evaporated. Remove from heat, and serve. Posted on April 13, 2014 by Worth Stopping By . . .
One of our local restaurants, Lucky 32, purchases locally grown produce daily. The chef has created a self-serve produce stand outside where you can pick up some of their extra fresh vegetables on the honor system. It’s a great way to grab some great items as well as support local growers. 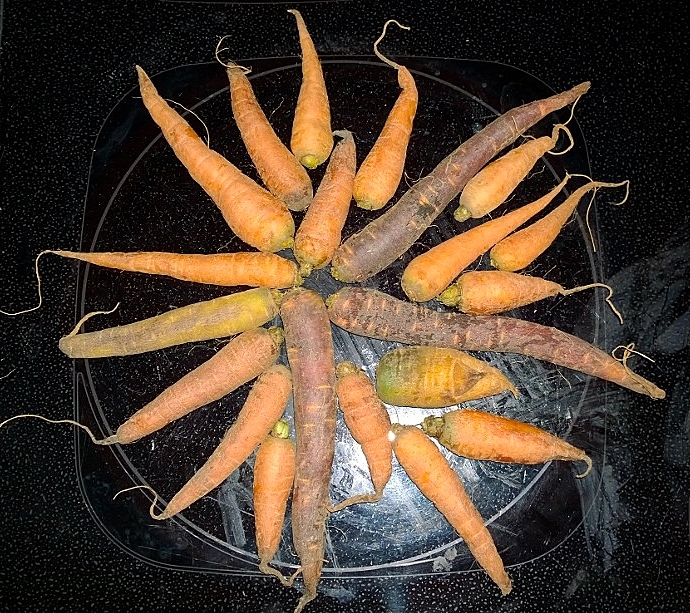 I stopped by last week and came away with a couple dozen baby carrots and four beautiful sweet potatoes. Since I’m still stuck on Chinese Five-Spice, I decided to try it out on some roasted carrots (from allrecipes) with great results. 2. Cut halved carrots in half again crosswise on the diagonal. 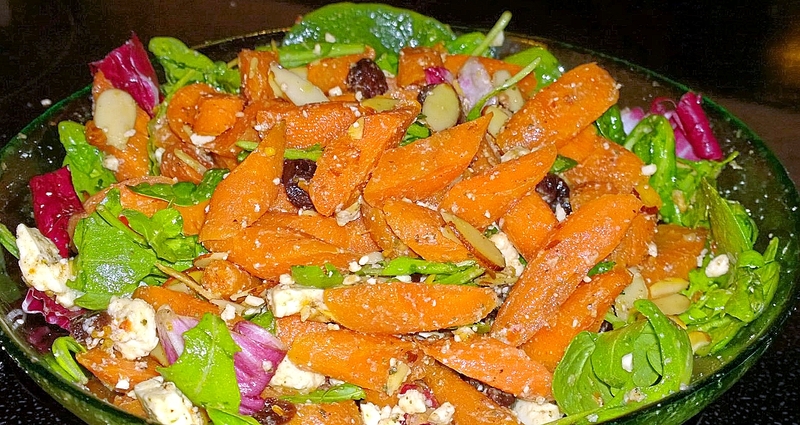 Place carrots into a 2-quart baking dish and drizzle with vegetable oil; sprinkle with five-spice powder and salt to taste. Toss lightly to coat carrots with oil and seasoning. Arrange carrots into an even layer. 3. 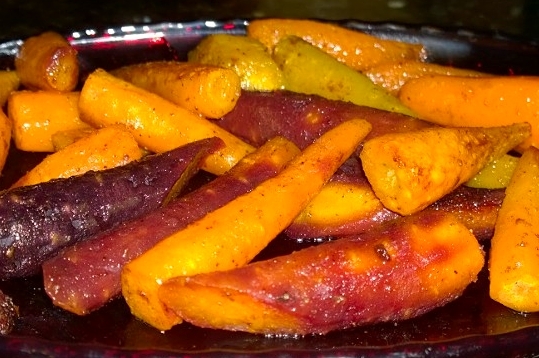 Roast carrots in the preheated oven for 15 minutes; check for tenderness and stir if desired. Continue roasting until tender, 15 to 20 more minutes. Posted on April 12, 2014 by Worth Stopping By . . . Omigosh!! What is not to love about this recipe? It is everything — healthy, tasty, beautiful, and portable. This recipe idea was posted on justapinch.com by the brilliant Pat Duran. I made this for a pool party a year or so ago. It was fun to create and it was very well received by one and all. Not only do you have a portable dip cup for your veggies, but you can eat the bread cup with the remaining dip inside. YUM! 1. Combine Knorr mix, mayonnaise, and sour cream in a medium bowl. Cover and chill at least 2 hours before using to allow flavors to blend. Stir before using. 2. Cut baguettes on a slant into 3 inch rounds; scoop out about 2 inched of center of each round leaving about 1/2 to 1 inch wall. I used one of my favorite kitchen tools for this — a grapefruit spoon! The serrated edges allow you to do “cut out” the center. Just take care not to dig too deep. Let set out while dip is chilling to dry out slightly. 3. I chose carrots, celery, red bell pepper, snow peas, and asparagus for my vegetables. I blanched the snow peas and asparagus for just a short minute to bring out the color, but leave them tender-crisp. 4. 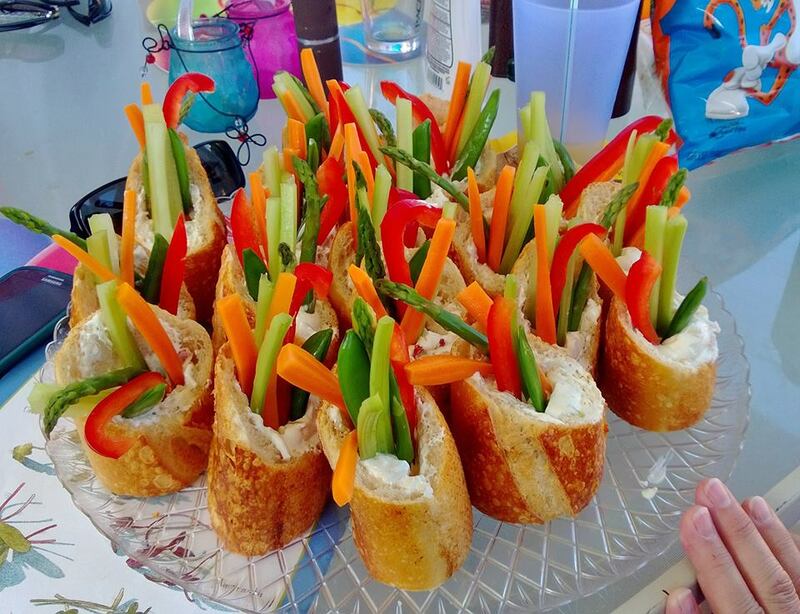 When ready to assemble place an ample amount of dip in each bread cup and add some of the prepared veggies into the dip in the little cups. Posted on April 9, 2014 by Worth Stopping By . . . I had a few leftover deviled eggs from the Beer Simmered Grilled Sausages, and I thought they would be the beginning of a great egg salad sandwich. But, first for the deviled eggs themselves. This is my mom’s basic recipe — again, nothing fancy. Hardboiled eggs, mustard, and Miracle Whip (I guess she was a big fan). I can’t apologize. I got hooked on these at an early age. 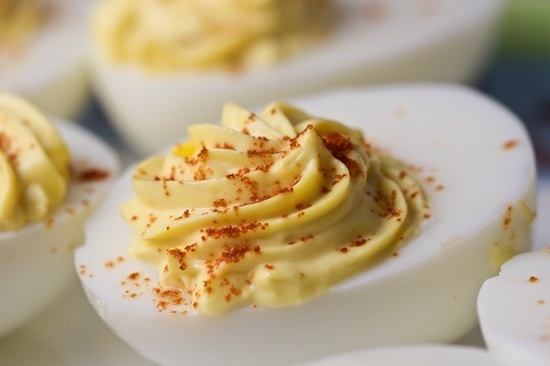 The secret to a good deviled egg filling is in the blending. I use a pastry blender to work the yolks down to a fine meal and to work in the liquid ingredients. I also like to use the SuperShooter by Hamilton Beach. It is so easy to pipe filling into eggs, pasta, mushroom caps, etc. Of course, top with some Hungarian Paprika. 1. Separate the filling from the white of the eggs. If the filling is a bit stiff, thin with a touch of apple cider vinegar. 2. Chop the eggs whites and add the onions and pickle relish. Stir in the filling mixture. Season with dill weed to taste. 3. Serve on toasted bread (I recommend Arnold Sandwich Thins).